Create an account now and receive a wonderful welcome package at Guts Casino. This generous package will give you on your first deposit 100% up to £100 plus 25 spins on Book of Dead by entering the code GUTSB1 and on your second deposit you will receive 50% up to £50 plus 25 spins on Book of Dead using the code GTSB2. The third deposit offers 25% up to £50 plus 25 extra spins on Book of Dead using the code GUTSB3, and last but not leat the forth deposit gives you 200% up to £100 plus 25 spins on Book of Dead by entering the code GUTSB4. 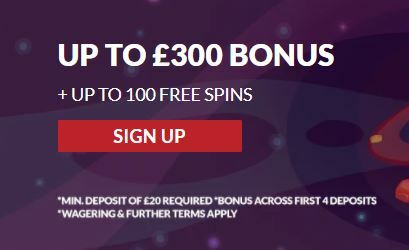 A minimum deposit of £20 is need in order to claim any deposit or reload bonus. Deposits made via Neteller, Skrill or Paysafecard will not qualify for this promotion. Match bonuses under 150% need to be wagered at least 35 times prior to withdrawing while bonuses of 200% or above come with an x45 wagering requirement. So you can see this is an offer you can't refuse. So get ready to get pampered! Play now and win big prizes!